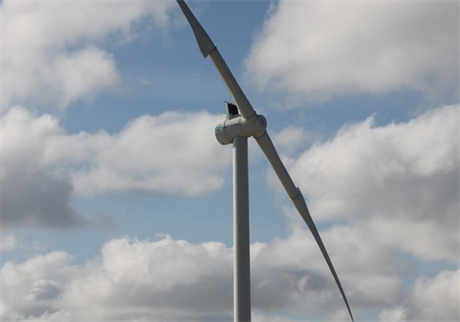 DENMARK: Since commissioning in October 2012 Envision's two-bladed EN128/3.6MW direct drive turbine has completed over a year of operation with further validation ongoing. Envision Energy (Denmark) director Anders Rebsdorf spoke about some main challenges faced developing the two-bladed machine. The EN128/3.6MW currently operates at a demanding coastal site in Western Denmark. The environment is characterized by 9.7 m/s average wind speeds. There are also low turbulence conditions from the sea and high turbulence from the south caused by industrial buildings and additional near-shore wind turbines. Rebsdorf: "These varying conditions gave us a great opportunity to validate structural dynamics of the design also in wind farm wake conditions. We are also proud about the fact that in the last months, the turbine’s availability was in line with mature serial products. But we are still learning." One specific issue occurred with the aerodynamic shells of the blade 20-metre inner parts. Called extenders, these fixed-pitch sections comprise a tubular section with aerodynamic shells attached by glue joints, which act as stall profiles. Rebsdorf explained: "Structurally the blade design proved sound, but last summer we discovered visible small cracks in the shell’s area close to the hub. For avoiding bigger issues developing in the future we removed the shells completely. Our supplier is now working on a redesign that will be implemented this spring. In the meantime we continued to operate the turbine without problems. One interesting result was a measured 8% power curve performance drop with the shells removed, a clear indication that the yield contribution of an aerodynamically shaped blade inner part is indeed significant." He added that the blade pitch bearings have performed as expected, despite the fact that they are mounted 20m out in the rotor and sandwiched in between two flexible composite sections offering a challenging operating environment. Similar positive experiences apply for the main bearings, the innovative lightweight carbon-epoxy composite drive shaft, and the direct drive PMG that electrically comprises two independent stator sections. Rebsdorf describes the EN128/3.6MW as a fine concept from installation, operation and serviceability points of view, but points at the PMG as expensive substantially driving up the cost of the nacelle. He said: "We explore how to use our two-bladed partial-pitch technology most effectively, and one option is licensing to third parties. Another is to merge our rotor design with a more cost effective drivetrain solution." The two-blade rotor design and turbine control strategy incorporate several dedicated built-in benefits aimed at minimized extreme loads during employment in typhoon regions and other demanding high-wind conditions. At above rated wind speeds, the blades are pitched out and the nacelle is mechanically turned 90 degrees relative to the prevailing wind direction. Currently, the rotor floats freely in horizontal position and acts similar to an old wind-wane where the drag ensures the orientation. Ther is documented stability of this horizontal "spear" position in more than 48 hours, and up to 52 m/s. Extreme tower loads were measured being less than 50% of normal loads. This enables lighter towers and foundations. Rebsdorf also pointed at specific additional benefits of the partial-pitch rotor design for floating wind turbine application. He said: "With a modern pitch-controlled rotor the thrust loads initially increase and later reduce again when the pitch system gets activated. For older-generation stall turbines with fixed blade angle, rotor thrust continues to increase with wind speed increment. "Our partial-pitch technology combines the benefits of both pitch and stall by offering advanced controls for limiting floating platform/turbine tilting movements resulting in enhanced operating stability. The result is significant cost savings in the turbine, the floater and the mooring system, and potentially elongated turbine design life." Finally a conventional three-bladed 4MW onshore/offshore turbine with 136-metre rotor diameter for IEC class II conditions was last year installed offshore in China and being tested. "Designed by Envision’s Danish design team the EN136/4MW incorporates a high-speed three-stage gearbox and induction generator. And because we do not compromise on quality, main components originate from mature supply chains being our philosophy for all Envision turbines. For 2014 I expect we will install 150MW of this model in the Chinese market", Rebsdorf concluded.